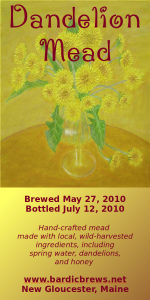 I used the same Basic Mead Recipe but made dandelion tea to use instead of water. Dandelions came from a friend’s yard. I only used the blossoms themselves. I brought 2 gallons of water to a boil, poured it over the blossoms, and let it sit overnight. In the morning I strained it and used that tea to brew the mead. I used 3 oranges and 3 lemons. 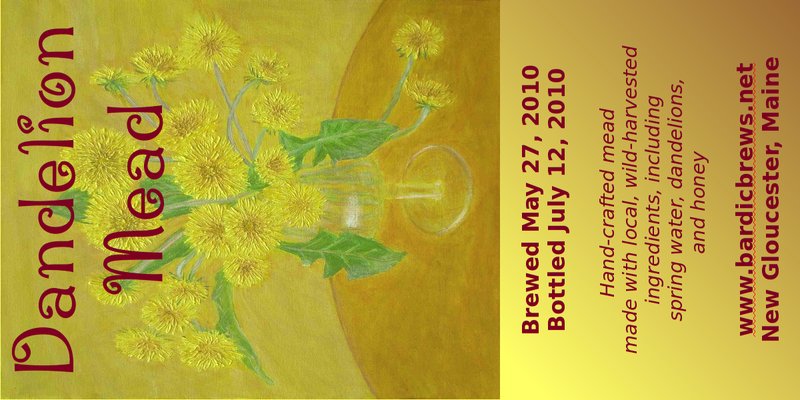 It was brewed on May 23. I haven’t racked it yet, but will in about 2 weeks. I have high hopes for this one; the tea was clean and delicious, and I know a few people who love dandelion wine. 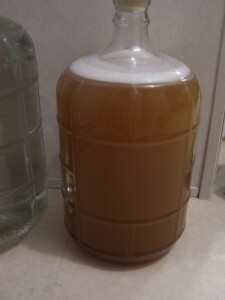 I brewed some spruce mead on Beltane (May 1). 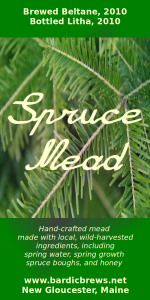 I used the same Basic Mead Recipe but before I started I gathered some new spring growth of spruce boughs from my yard. I decocted the boughs in the spring water for several hours, cooled it overnight, and strained it. I then used this tea to brew the mead as above. 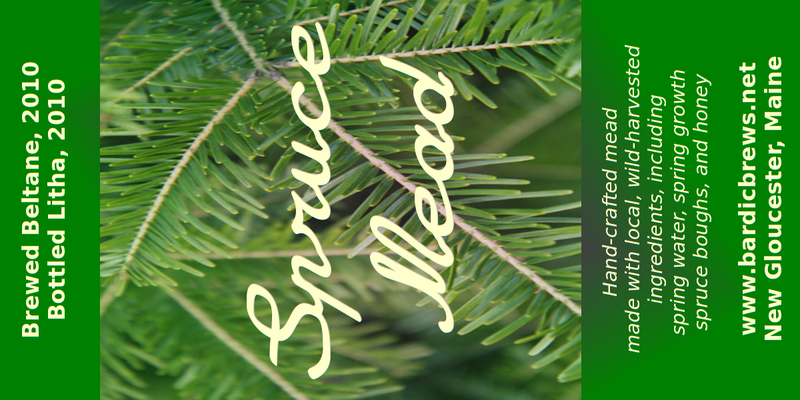 One modification: spruce contains ascorbic acid (vitamin C, settlers and natives used it to fight scurvy) so I only used 2 lemons rather than 6. This batch was racked a few days ago, and is already surprisingly tasty. A good, clean, sweet mead, with an unusual afterflavor of spruce. Nice, and should only get better with age! This is my basic mead recipe, which is very versatile and can be adapted in as many ways as you can imagine. The recipe comes from my friend and brewing mentor Harper Meader, who developed it over 20 years of trial-and-error experimentation. I have adapted it in several ways, including converting it to 3-gallon batches which I find very convenient to do for mead. This methodology produces a very sweet mead, which most newbies (and many old-timers) seem to prefer. In reality you can use much less honey if you desire a drier mead. 3/4 of a gallon is still on the sweet side actually. If you prefer to be more precise, then you can use a hydrometer to see where you are. A beginning alcohol potential of 20% will produce an extremely sweet meat. 15% will produce a pretty dry mead. You can start anywhere in between, as you experiment and learn. In general, use the best quality ingredients you can. The water I use is some of the cleanest water on earth, at 10ppm TDS, that I collect myself from a spring on the top of a mountain. In my opinion, quality water is one of the most important aspects of brewing in general. For mead, quality honey is important as well. Use honey that has not been heat treated, and has not had toxic chemicals sprayed into the hives for any reason. Your best bet is to find an apiary near you, talk to them, and find out how they produce their honey. I get a gallon of honey from an apiary near me for about $35. The notion of “organic honey” is hazy at best, since bees collect pollen from such a wide geography. The main thing is to make sure the beekeepers aren’t chemically treating or heating their honey. If they aren’t, then it’s likely to be good quality honey. I am currently using Red Star Montrachet yeast for my meadmaking, though any sort of wine yeast will do. I haven’t experimented much with using different yeasts, because this yeast works beautifully. I haven’t needed to change, and this yeast is readily available in my area. I do wish to start experimenting with wild yeast. Wine yeast is expecting grapes, which contain citric acid and tannic acid, 2 things honey does not contain. To compensate for this, we will add oranges or lemons (for the citrus), and black tea (for the tannins). Additional flavorings can be fruit, herbs, cacao, vanilla, spices, anything your imagination tells you will taste good. In a 3 gallon stockpot, add the gallon of honey and about 1.5 gallons of spring water. Stir and mix well. If you need to heat it gently to get the honey to dissolve more completely, then do so but I don’t recommend heating it more than 100 degrees. Next, add the juice from the oranges/lemons to the pot. Use a small saucepan, and bring a few cups of water to a boil. Put in the 3 bags of black tea, and let steep for 3-4 minutes. Remove the teabags and add the tea to the stockpot. Then, prepare the yeast. Empty the yeast packet into a small bowl and add some water over the top of it, stir (preferably with wood not metal) and dissolve the yeast. Let it sit for a few minutes until it starts to bubble and smell vaguely of bread. At this point, you can add any additional flavorings you’d like to use. If you are using fruit, then I like to blend it up (liquify it) in a high-speed blender. Add all the ingredients, and mix well. Once all the ingredients are in the stockpot, make sure it cools to below 90 degrees (hopefully it never made it above there to begin with). When it’s cool, pour the yeast/water into the bottom of your carboy. Then, pour the must (the liquid in the stockpot) through a funnel into the carboy. It should be less than 3 gallons of liquid, so add additional water to bring it up to 3 gallons. Put a stopper on the carboy, pick it up, and shake it vigorously to dissolve and oxidize the yeast. Finally, put a stopper on the top of the carboy, and seal it up with an airlock. Within 12-24 hours the mixture will start bubbling vigorously, and the fermentation will have begun! Note: watch the first day of fermentation very closely. It can get so vigorous that it can literally shoot out the top of the carboy! If this happens, use your siphoning hose in the stopper, and put the other end of the siphoning hose into a bucket filled 1/3 of the way with water. This will allow the fermentation to “blow off” the gases without making a huge mess (this is NO fun to clean up, trust me). 3-6 weeks after you put the batch up, the bubbling will slow down and eventually stop, and the mead will begin to clear (all the sediment falls to the bottom). At this stage, I siphon the mead off, leaving the sediment in the bottom, into 1 gallon glass jugs. You should get 2 gallons of clear mead, allow this to continue to ferment and age (seal up the 1 gallon jugs with an airlock). Of the remaining mead in the carboy, get as much clear stuff off the top as possible. Then, you can drink the sediment right away or use it in cooking. It should already be delicious, and will only get better with age! Once the mead clears even further in the 1 gallon jugs (over the next several weeks/months), it will be ready for bottling. Use your siphon to draw the liquid off the top and fill your bottles. Steam the corks while you are siphoning to both soften and sterilize them. Use a corker to install the corks into the bottles, and put them up! The longer they age the better it will get. Of course you want to label your meads, if for no other reason that you’ll know what kind it is when you open an aged bottle, long after you forgot about the batches. Get creative! Doing the labels is, in some ways, the most fun part of the process apart from drinking your finished mead. Following is an English translation of the Reinheitsgebot (German Purity Law) adopted in 1516, the oldest provision still enforced to protect the consumer. This is taken from the article “History of German Brewing” by Karl J. Eden, published in “Zymurgy” magazine, Vol. 16, No. 4 Special 1993. “From Georgi to Michaelmas, the Mass shall not be sold for more than two Pfennig of the same value, the Kopf not more than three Heller [Heller usually one-half Pfennig]. “If this not be adhered to, the punishment stated below shall be administered. “Should any person brew, or otherwise have, other beer than March beer, it is not to be sold any higher than one Pfennig per Mass. “Furthermore, we wish to emphasize that in future in all cities, markets and in the country, the only ingredients used for the brewing of beer must be Barley, Hops and Water. Whosoever knowingly disregards or transgresses upon this ordinance, shall be punished by the Court authorities’ confiscating such barrels of beer, without fail.